The Pioneer DDJ-SR2 Professional DJ Controller is a professional-grade, 2-channel DJ controller, building on the success and design of the original DDJ-SR. The DDJ-SR2 DJ Controller boasts large, touch-capacitive jog wheels, ensuring the lowest possible latency for optimal performance value when it comes to mixing and scratching. The DDJ-SR 2 DJ Controller also boasts mutlicoloured performance pads for triggering samples, cues, one-shots and more. This DVS-ready controller also includes Pitch 'N Time Serato DJ Controls, providing you with a range of dedicated buttons used to trigger functions within the Serato DJ software. The DDJ-SR2 is highly compact and portable, as well as boasting a wide range of connections including balanced XLR outputs. 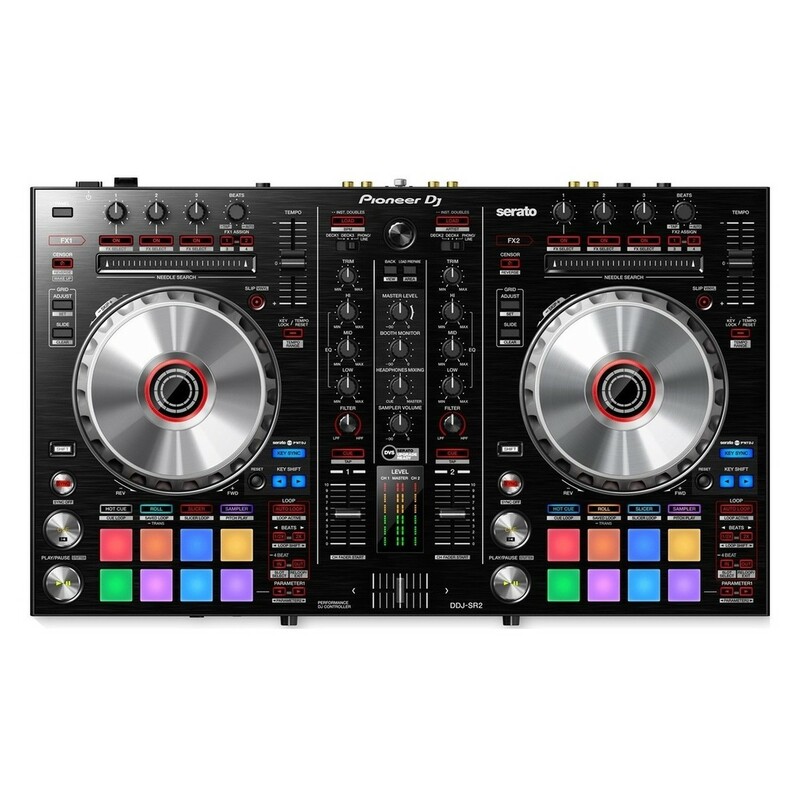 Additionally, the Pioneer DDJ-SR2 comes complete with the latest version of Serato DJ to get you started. The Pioneer DDJ-SR2 Professional DJ Controller is the latest edition to the DDJ series from Pioneer, delivering a professional-grade DJ controller for intermediate and pro DJs alike. The Pioneer DDJ-SR2 builds on the success of the first edition, retaining all the major features from the original while expanding on its functionality. The large, touch-capacitive jog wheels provide ultra-low latency performance for optimal accuracy when it comes to scratching and mixing tracks. The ergonomic layout and premium-grade components such as the faders, buttons and knobs provide a comfortable and intuitive mixing experience. As well as being ideal for use with Serato DJ, the controller is Serato DVS Upgrade Ready (licence available separately). 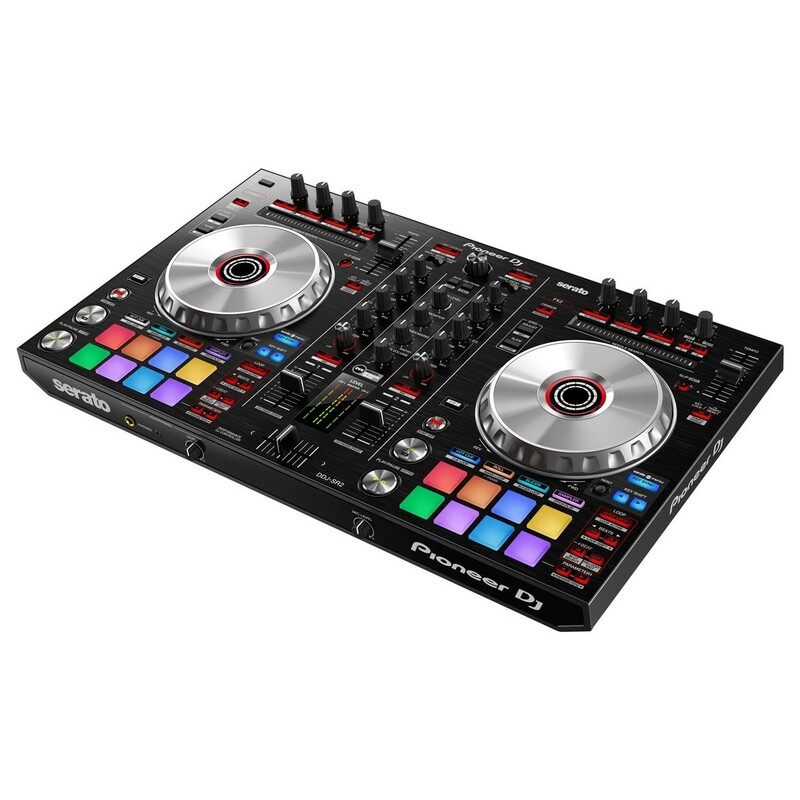 One of the most prominent features of the DDJ-SR2 DJ Controller is the 16 multicoloured performance pads. The tactile performance pads allow you to trigger Hot Cues, Roll and Sampler functions, adding a new dynamic to your mixing and scratching. The pads change colour to indicate the selected pad mode and playing status. The ultra-responsive pads are ideal for a range of applications from providing quick and easy cues to triggering one-shot samples and FX that can help to blend between tracks. As well as the performance pads, the DDJ-SR2 also boasts new performance controls including the Needle Search Pad. This unique and innovative feature allows you to instantly jump to a certain part of the track, simply by touching the pad. This is useful when it comes to live sets, allowing you to find your required cue points and loops within a track more easily than ever before. The new dual level meter also provides precision monitoring for your levels, allowing you to see the Master Out and channel levels at all times. The controller also features a dedicated FX section for adding high-quality effects on the fly. 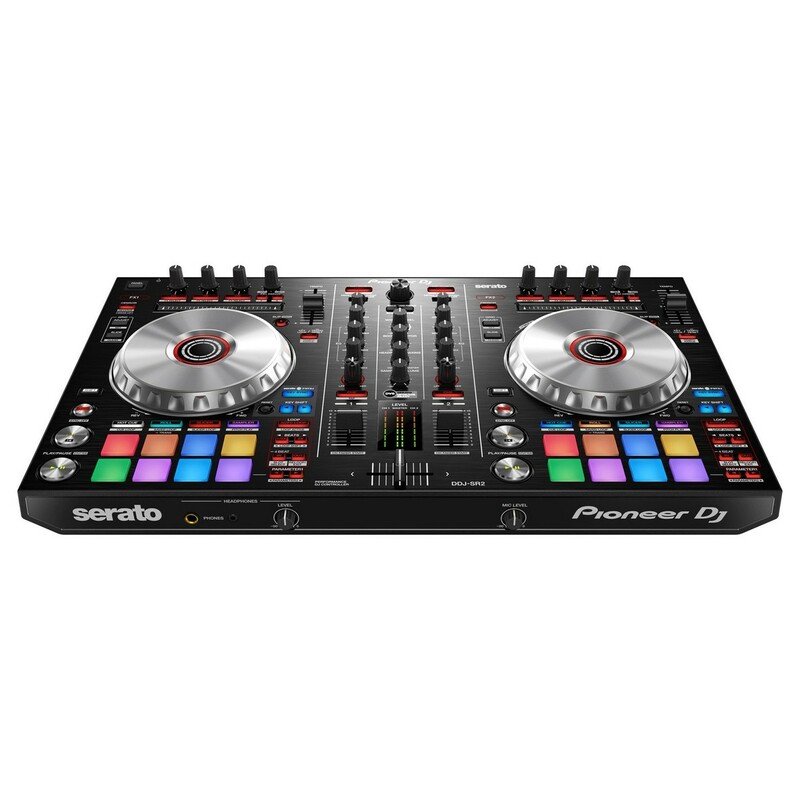 A new addition to the design of the Pioneer DDJ-SR2 is the dedicated Serato DJ buttons, providing hardware control for Serato Pitch ‘n Time DJ (included). The functions come in the forms of three buttons including: Key Shift, Key Sync and Key Reset. Key Shift allows you to change the key of a song by semitones without changing the tempo. Key Sync allows you to sync keys of different track during mixes at the touch of a button. Key Reset allows you to reset the song’s key after changing it. The new audio mixer feature allows you to control music tracks stored on your computer via Serato DJ. This allows you to use the trims, channel faders and EQs to control audio from external equipment. Even when the control isn’t connected to a computer, the trims and channel faders can be used for audio input from external sources. The compact and portable Pioneer DDJ-SR2 is ideal for a range of applications, from home use to live performances. The DDJ-SR2 is now 18 percent lighter than the original DDJ-SR, making it easier to transport on the move. As well as being highly compact and easy to take with you, the controller also boasts a wide range of connectivity including a dedicated microphone input, a booth and two master outputs as well as professional-grade XLR master output, TRS booth output, and a second master output for added flexibility. The controller can also be powered via USB bus or by an external AC adapter for ultimate portability.